The 2017 edition now half price! 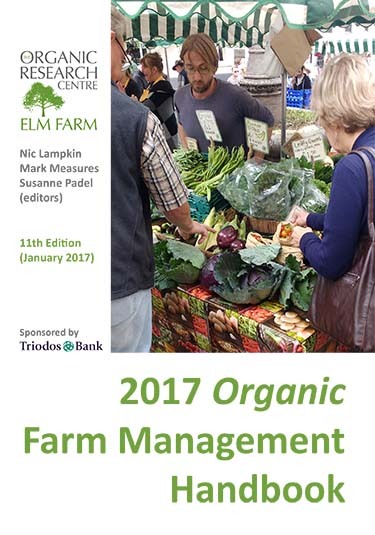 This is a ‘must have’ publication for everyone interested in the business of organic farming and growing. The new edition provides technical and financial data, information on current support schemes, Brexit permitting, as well as an update on organic markets as growth returns. Recent years have seen clear signs of confidence returning to the organic sector, with strong market growth and renewed interest from producers in conversion to organic production. The fall in the value of the pound following the Brexit referendum has created new opportunities for expanding exports. In the UK domestic market it has meant a more competitive position for UK producers in the light of more expensive imports. Also the Organic Trade Board has been successful in securing €10.4 million (from Industry and the EU) for a joint promotion campaign with Organic Denmark. With continuing uncertainties about how Brexit will be implemented – deal or no deal – we have decided to postpone preparation of a new edition until late 2019. In the meantime, the 2017 edition will remain on sale at a bargain price!